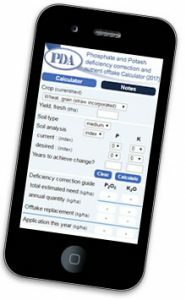 This phosphate and potash nutrient calculator is for farmers and crop nutrition advisors in England, Wales and N Ireland*. It does two calculations, nutrient offtake and nutrient deficiency correction. You can also use the calculator as an app on mobile phones and tablets by following the instructions provided below. It enables a quick calculation of the phosphate (P2O5) and potash (K2O) offtakes by most UK crops at harvest. Enter the crop details and yield in the top section, then click the ‘Calculate’ button to show the nutrient offtakes on the bottom lines. These quantities are often termed ‘maintenance dressings’, and usually provide the recommendation for fertiliser use when the soil Indices are at target level (with some exceptions, such as potatoes). If the soil Index is above the target level a fertiliser dressing may be reduced or considered unnecessary. The cost of such maintenance dressings should of course be charged to the crop being grown. If soil Indices* are below the target level the second section of the Calculator provides a guide to the quantity of nutrient which is likely to be required to correct the deficiency. This will vary according to the level of deficiency and the soil type. The quantity will usually be more than can reasonably be applied in one season, and the Calculator asks by how much and how quickly you want to correct the deficiency, i.e. over how many years. The desired improvement can be input by Index or more precisely by mg/litre as determined by soil analysis*. Once all relevant information has been input (for one or both nutrients) clicking on the ‘Calculate’ button will provide a guide to the total quantity of nutrient(s) which will be required. The annual dressing is also shown, according to the timescale selected. The bottom line shows this annual deficiency-correcting application, together with the maintenance dressing. The cost of the nutrient(s) required to correct the deficiency should not be charged to the crop being grown but should be accounted for separately. It is important to read the notes attached to the Calculator. 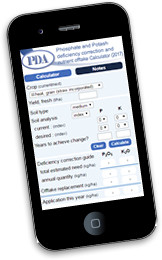 Also, further information is provided in the PDA Newsletter Calculator for estimating nutrients needed to correct soil deficiency, with additional background in Standard recommendations cannot make a poor soil good overnight. The Calculator cannot be used to indicate timescales for any reductions in Indices higher than target. * The soil nutrient Indices are those described in the PDA Leaflet 24 ‘Soil analysis: key to nutrient management planning‘ and in the AHDB Nutrient Management Guide (RB209). The analytical values (mg/litre) are those derived by Olsen’s method for P and by exchange using ammonium nitrate for K.
The Calculator has been designed to work on tablet computers and smart phones, as well as on standard computers. If you bookmark the Calculator on your device then you will be able to access this at any time, even if you have no internet access. In order to be able to achieve this, when you view the Calculator for the first time, it will save the data it needs onto your device. If you are using Firefox, you may see a warning about this, but it is safe to accept, as we only save the information that is essential for the Calculator to work, and at no time is any of this information transmitted to us – if you will only use the Calculator while connected to the internet then you can ignore the warning. The exact steps required to add the Calculator to the home screen on different mobile phones varies. The instructions below provide some general instructions which you may need to adjust slightly depending on your model and precise software. you will now see an icon on the home screen of the device. Clicking on this will take you straight to the Calculator. when you close your browser you will see an icon on the home screen of the device. Clicking on this will take you straight to the Calculator. Alternatively on some Android devices you may need to take a few extra steps. press and hold on the bookmark until a new menu appears, and in this menu select the ‘Add to home screen’ option. This will pin the calculator to your home screen. you should then be able to use your bookmark to open the page, even if you do not have network access at the time.